With more than 20 years of steel drum experience, RythmTrail offers you the answer to all of your steel drum band needs. 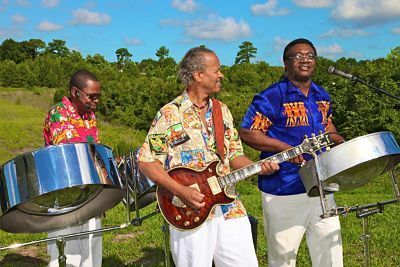 Our steel drum players are ready to bring top-notch Reggae , Soca, Calypso, and steel drum music to any and every event in Vero Beach- beach weddings and wedding ceremonies, corporate events, rehearsal dinners, house parties, birthday parties- you name it. RythmTrail is but a click away, and won’t break the bank, either. We offer one of the most affordable steel drum bands without sacrificing quality. Whether you need the full steel drum band or a solo player for your next event, trust RythmTrail to bring you the sounds of the Caribbean. We’re all native Caribbean islanders, so we guarantee your musical needs will be met by some of the most talented steel drum players in the world. RythmTrail doesn’t just perform at beach weddings and parties in Vero Beach- we also travel to events all over the state of Florida, across the country, and even internationally! Trust our name to deliver the best steel drum music for your special day, and don’t deal with the hassle of our imitators. Let us take the reins and play whatever style of music you want- romantic, cheerful, dramatic- or we’ll even play your own personalized playlist of favorite songs. Don’t delay! Our schedule fills up fast, so call RythmTrail today at 866-495-4522 or get a free quote online, and let us turn your next party or event into a tropical paradise. Live steel drum music in Vero Beach FL today for a corporate event. The best steel drum band in Vero Beach.